Us. Them. The contrast has been around since Cain and Abel, since Isaac and Ishmael, since Ayla and Broud. Humans seem destined to find and accentuate differences. No matter how "modern" we are, tribalistic tendencies are alive and well as we interact with others. Even now we have deep schisms between Democrats and Republicans. Between white collar and blue collar. Urban and rural. Labor and management. Young and old. Haves and have nots. Add in race and ethnic differences, and you've got a whole lot of Uses and Thems, right here in the United States of America, and in the countries of most of my readers. But we really don't know deep, fracturing splits -- not here. Say You're One of Them by Uwem Akpan is a five-story showcase of deep schisms -- Mariana Trench-deep schisms -- on the continent of Africa. It's harsh, this book that Oprah chose as her 2009 Book Club Selection. Each of these five stories is told from a child's point of view. The adults in the lives of these children are impotent to protect them, to defend them, to stop the carnage around them. In fact, in some cases, the adults are complicit in the brutality toward them. 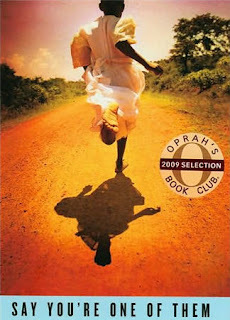 An Ex-mas Feast is set in Kenya (east-central on the continent) and told by an 8 year-old boy, Jigana. His 12 year-old sister has become a prostitute to support the 6 children and 2 parents, as well as to send Jigana to school, thereby giving some hope to someone in the family. Amid epithets from her parents ("Wh0re! "), Maisha is the one to secure necessities like food and luxuries like meager Christmas presents for the family. The parents are able to meet their children's hunger only with glue -- sniffing the fumes takes away the pangs. The 10 year-old sister is watching and learning from Maisha, and does not yet realize the true cost of the trinkets. In Fattening for Gabon (west-central) Kotchikpa, 10, and his sister Yewa, 5, experience a sudden bounty from their uncle, who has been taking care of them since their parents contracted AIDS. Why the sudden bounty, and at what price? What treachery has their uncle been up to? The short What Language is This? is set in Ethiopia (eastern horn) and is told, curiously, in the second person voice. Two young girls -- one Christian and one Muslim, have their friendship severed by grownups' religious conflict. Their broken balconies provide a short-term place to communicate with each other amid the uncertainty of the world, of their friendship. Luxurious Hearses features Jubril, a 16 year-old Muslim whose life depends on blending in to a Christian and pagan crowd of refugees on a bus, which is bound from Nigeria's north to its south, away from killing riots. Can he hide his horrific, identifying mark of his religion, his allegiance? Other riders of the Luxurious Bus (a/k/a Luxurious Hearse because it also transports corpses from one region to another) bring their viewpoints on the horrors about the conflict between the Muslims in the north and the Christians in the south. Added into the mix is a tribal chief, sub-tribal clashes, oil corporations, democracy, government ineptness and corruption, and an intermingling of languages. Finally, My Parent's Bedroom involves a 12-year old girl in Rwanda (heart of Africa) who has a Hutu father and a Tutsi mother. Unspeakable horrors take place in her home as it becomes a microcosm of the ethnic conflict that raged for 100 days in Rwanda in 1994. Do NOT read this book as a pick-me-up. Do NOT read this book on a vacation to get away from it all. Do NOT read this book if you are looking for a quick, easy read. Read this book if you want to rock your world, to get outside your comfort zone, to know how green the grass is on your side of the fence. I'm giving away my hardcover copy to one commenter. If you are willing to pay shipping & handling ($5 in the US; $10 in Canada) via my tip jar, please indicate in your comment that you'd like to enter the drawing. I'll randomly pick a winner on December 14. I definitely would pay for S&H if I were to win this book. I am intrigued; thank you for reviewing it. Frank had a HUGE paper due on the Rwandan genocide this week that I had to help him with. I was only a junior in high school when it happened and at the time, I did not full understand the historical division between the Hutu and Tutsi that led to the massacre. Helping Frank with his research was eye-opening for us both. We'd watched "Hotel Rwanda" a few years ago, but last night rented and watched it again with renewed clarity and understanding. If I don't win the book, I'm definitely going to buy it. This book sounds awesome, in that holy f*, I'm crying while reading my book way. This does sound intriguing. I'm willing to read it. Wow, sounds like some heavy stuff. Not sure if I ever mentioned that our daughter's name is partially an ode to Ayla? I'd love to read such a mind-expanding book. We really do have it good, don't we? I am grateful every day. wow, you loved it so much you're willing to give your copy away!